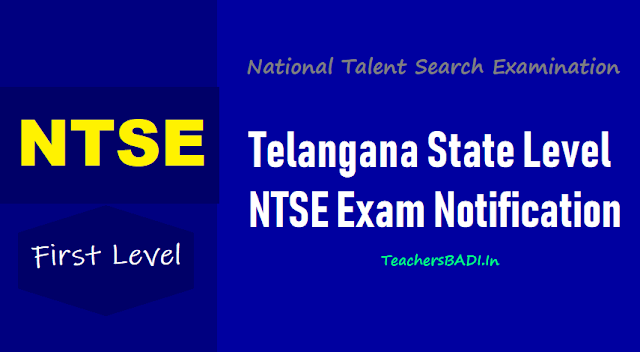 Telangana/TS NTSE 2018 Notification for Class X: The state level National Talent Search (first level) Examination 2018 Notifications would be issued soon by the office of the Director of Government Examinations, Telangana State in August 2018. The State Level National Talent Search 1st level Examination for 10th class students will be conducted on 04-11-2018 (Sunday) from 11.00 AM to 12.00 PM and and Second session from 2.00 PM to 4.00 PM in Telugu/ Hindi/ Urdu and English media at all the Head quarters of 31 Districts in the State. నేషనల్ టాలెంట్ సెర్స్ ఎగ్జామినేషన్ మరియు నేషనల్ మీన్స్ కం మెరిట్ స్కాలర్షిప్ పరీక్ష నవంబరు 2018 తేదీ 04-11-2018 న జరుగనున్న నేషనల్ టాలెంట్ సెర్చ్ ఎగ్జామినేషన్ మరియు నేషనల్ మీన్స్ కం మెరిట్ స్కాలర్షిప్ పరీక్ష లకు రుసుమును సకాలములో అనగా తేది 14.09.2018 న గాని ఆలోపుగాని చెల్లించికూడ దరఖాస్తులు ఆన్ లైన్లో రిజిస్టర్ చేసికొనలేక పోయిన విద్యార్ధులు మాత్రమే తేది 19-09-2018 న ఒక్కరోజు దరఖాస్తులు ఆన్ లైన్లో రిజిస్టర్ చేసికొనుటకు అనుమతించటమైనది. పూర్తి వివరములను ప్రభుత్వ పరీక్షల సంచాలకుల కార్యాలయపు వెబ్ సైటు http//bse.telangana.gov.in నందు పొందగలరు. "పరీక్ష రుసుమును పైన తెలిపిన కాలములో చెల్లించని విద్యార్ధులకు దరఖాస్తులు ఆన్ లైన్లో రిజిస్టర్ చేసి నటను అనుమతిలేదు." Rc.No.02/E2-1/2018; Dated: 18-09-2018 :: It is hereby notified that, only those candidates who have paid the examination fee for NTSE and NMMSE Nov - 2018 which are going to be held on 04.11.2018 in time i.e on or before 14.09.2018 but could not registered their applications on-line have been given an opportunity to register their applications on-line on 19.09.2018 in this office website http//bse.telangana.gov.in Others are not allowed to register. TS National Talent Search Examination (NTSE) for class X: Director of Government Examinations, Telangana State invites applications for National Talent Search Examination (First Level) for class X. The number of scholarships will be allocated by NCERT every year. The candidates will be selected to the Second Level basing on the merit and as per the reservation norms given by NCERT. 1000 candidates every year are being selected in Second Level Examination all over the country. Scholarship will be paid by the NCERT, New Delhi. Rs.1250/- per month for Intermediate 1st and 2nd years. Rs.2000 per month up to Post Graduation. For Ph D as per UGC norms. The students who are studying X class during the current academic year 2018-2019 n any recognized school in Telangana State including Kendriya Vidyalayas and schools affiliated to ICSE and CBSE. Last date for remittance of examination fee in the shape of Challan: 15th September, 2018. Last date for registered of applications online: 15th September, 2018. Last date for submission of printed copy of online registered Application Form along with fee in the shape of Challan (original only), copies of caste and medical certificates in case of SC/ ST/ OBC/ PHC candidates and NR (two copies of NRs) by the candidate/ Head Masters of the schools concerned in the office of concerned District Educational Officer: 15th September, 2018. Last date for submission of Printed Application forms and Nominal Rolls attested by concerned Head Master, along with Original Challans by the concerned DEO’s to the O/o the Director of Government Examinations, T.S., Hyderabad: 17th September, 2018. Date of Exam (stage I): 4th November, 2018. DGE Telangana: Rc.No.02/E2-1/2018; Dated: 07-08-2018 :: It is hereby notified that the State Level National Talent Search (First level) Examination for class X will be conducted on 04 -11-2018 (Sunday) in two sessions i.e first session from 10.00 AM to 12.00 PM and Second session from 2.00 PM to 4.00 PM in Telugu/ English / Urdu and Hindi media at all the Headquarters of 31 Districts in the State. The students who are studying X Class during the current academic year i.e., 2018¬2019 in any recognized school in Telangana state including Kendriya Vidyalayas and schools affiliated to I.C.S.E. & C.11S.E., New Delhi are only eligible to appear for the above said Examination. The students who have selected for NMMS scholarships and studying X class now may also eligible to apply for NTS Examination but such candidates have to forego the further NMMS scholarships, if he/she is selected in NTS second level Examination. DGE Telangana - It is hereby notified that the State Level National Talent Search (1st level) Examination for class X will be conducted on 04-11-2018 (Sunday) in Telugu/ Hindi/ Urdu and English media at all the Head quarters of 31 Districts in the State. The students who are studying X Class during the current academic year i.e., 2018-2019 in any recognized school in Telangana state including Kendriya Vidyalayas and schools affiliated to I.C.S.E. & C.B.S.E., New Delhi are only eligible to appear for the above said Examination. The students who have selected for NMMS scholarships and studying X class now may also eligible for NTS Examination but such candidates have to forego the further NMMS scholarships, if he/she is selected in NTS Examination. The examination consists of Mental Ability Test for 50 marks with 50 questions, Language Comprehensive Test for 50 marks with 50 questions (Telugu/Urdu/English) and Scholastic Aptitude Test for 100 marks with 100 questions comprising Social sciences (40), Sciences(40) and Mathematics (20). Each question carries one mark. Language Comprehensive Test will be qualifying in nature and marks will not be added for deciding final merit list of the candidate and not to be added in the grand total. Examination tee Rs.100/- Rupees Hundred only per candidate should be paid through chalan at any treasury branch which are available in this office web site before online registration of applications as the particulars of Examination fee should be noted in the application form at the time of registration. Consolidated challan for all the candidates from one school is preferable. Names of concerned candidates should be written on the reverse side of the ehalan. (DDs are not acceptable). Application form should be registered online in this office web site `http://bse.telangana.gov.in' as explained in user guide. Printed copy of online registered Application Forms along with original Challan and two copies of print of report (i.e. nominal roll) should be submitted in Office of concerned District Educational Officer only. Off line applications are not accepted. Application form should be registered online in this office web site `httollbse.telangana.gov.in' as explained in user guide. Printed copy of online registered Application Forms along with original Challan, copies of caste certificates issued by MRO concerned and medical certificates issued by Medical Board of concerned District in case of SC/ST/OBC/P1-IC and two copies of print of report (i.e. nominal roll) should be submitted in Office of concerned District Educational Officer only. In case of SC/ST/OBC/PHC candidates caste and medical certificates should be uploaded along with application at the time of registration on line. In case of OBC candidates. those who are listed in the central list of OBCs (state wise) available in the web site ]tttp://www.nebc.nic.in/user/panellcentralliststateview.aspx subject to the income limit notified by the Government should Furnish caste and non-creamy layer certificates for OBC reservation. Otherwise they will be treated as general candidates. The following are the due dates for remittance of Examination fee, registration of applications, submission of printed applications, original chalans and printed NR. 3. Last date for submission of printed copy of online registered Application Form along with fee in the shape of Challan (original only) and NR (two copies) by the candidate/Head Masters of the schools concerned in the3 office of concerned District Educational Officer. (Printed Application form & NR must be attested by concerned Head Master.) (Attested copy of the caste and medical certificates in case of SC/ST/PH should be enclosed otherwise they will be treated as general candidates). 4. Last date for submission of Printed Application forms attested by 4 concerned Head Master, Nominal Rolls along with Original Challans by the concerned DEO's to the 0/o the Director of Government Examinations., T.S.. Hyderabad. The examination fee has to be paid in form of Challan to the following Head of Account drawn only in SBI or SBH where Challan (Treasury) facility is available. Hall Tickets can be down loaded from this office web site `http//bse.telangana.gov.in' at least one week before the examination. For any further details in this regard concerned District Educational Officer or Office of the Director of Government Examinations., T.S., Hyderabad at 9177002454, 9177002457, 9247834799 may be contacted. The students who are studying X Class during the current academic year i.e., 2018-2019 in any recognized school in Telangana State, including Kendriya Vidyalayas and schools affiliated to I.C.S.E. and C.B.S.E., New Delhi are only eligible to appear for the above said Examination. The students who have selected for NMMS scholarships and studying X class now may also eligible for NTS Examination but such candidates have to forego the further NMMS scholarships, if he/she are selected in NTS Examination. There will be two-stage selection process for award of scholarship to class X students of AP and Telangana. For Stage I, selection will be done by the both states of AP and Telngana through NTS first level examination November-2018. The Students of AP, who qualify Stage-I, will be eligible to appear for Stage-II examination, conducted by NCERT. As the last date (31-Aug) is very close, can you please have the application form for 2016 available on the site as my school doesn't have the form yet. State Level NTSE 2015 notification not released yet. Education Department will release the notification along with fresh/new dates for applying.. Notification has not released right now..
For How to Apply..please read the Once again..
sir, i want to apply through online as i am not in telangana right now, but the website (www.bseap.org) does not have the application form. when will it be released? and when is the final date for submission of the application form? Hope it would be 107.
where isss the challan form???????????????? Hello Sir, When do you publish hall tickets through Online? Can some one let me know the center address of ZPH School, R. P Colony hyderabad > any phone number /mail id to cross check the address.